I love seeing the new lists of books Quarto Knows comes out with and I love that we get to test and try out a lot of the new Quarto Knows products. Quarto Knows not only has amazing paper back and hard cover books; they also have a wide variety of activity kits with books included. We got to test out Marvels Secret Message Lab, Make Your Own Disney Princess Lip Balm, Spa Soaps Forest Friends, Make Your Own Toy Story Soaps, All Natural Spa Soaps, SmartLab Toys Crazy Drinks Science, SmartLab Toys Shimmering Balm Science, SmartLab Toys All Natural Balm Boutique and SmartLab Toys Extreme Secret Formula. The Marvel the Avenger's Secret Message Lab I knew Christian would like. He is always buying secret message notebooks and decoder pens at the school book fair. 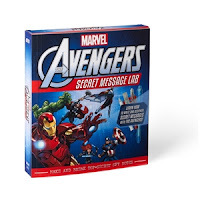 This set allowed him to take that interest so much further and truly begin decoding some secret messages! 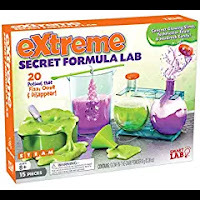 He was eager to try his scientific skills out on his own and wanted to do some experiments on his own from the SmartLab Toys Extreme Secret Formula Lab. All of these kits were super fun and cute. The kids had a blast and each had their favorite kit and activity. The EXTREME version features tailored components such as a mix and measure scoop, test tubes with squishy lids and more. Kids can concoct 20 experiments that glow, ooze and stink up the kitchen. From the glow in the dark alien blood to scratch and sniff stickers, young scientists will never have so much fun with a beaker, test tubes and commonly found household ingredients. SmartLab Toys Crazy Drinks Science Lab was another favorite of the boys. You create twenty different drinks with this kit! I loved watching the kids learn while playing. Gavin has always been a Toy Story fan it came out when he was a toddler and he loved it. 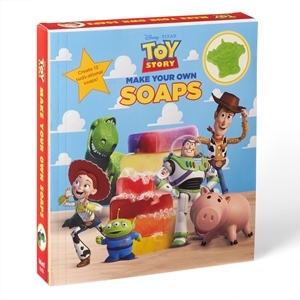 So he enjoyed making the Toy Story: Make Your Own Soap Kit. He loved actually using the soaps he made even more! The kit includes twelve original recipes, melt-and-pour soap base, soap dyes, a character face mold tray, five punch out gift boxes, and more. With more than thirty full-color photographs and clear step-by-step instructions, this kit has everything you need to bring this crew to life. 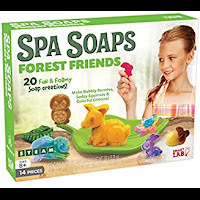 We also tried the SmartLab Toys Spa Soaps Forest Friends soap making kit. The kit includes enough ingredients to make twenty fun and foamy soap creations. We made colorful critters like bubbly bunnies and sudsy squirrels. All the kids enjoyed the Forest Friends kit as they all like animals and enjoy sculpting and molding animals. 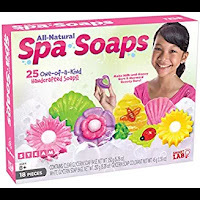 The SmartLab All-Natural Spa Soaps was super neat because Sierra is allergic to so much she rarely gets to participate. This was all-natural so we gave it a try. She loved it! Sierra enjoyed making the lip balm kits for everyone as Christmas gifts from her. 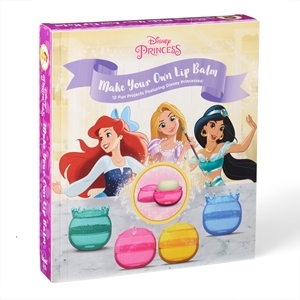 The Make Your Own Lip Balm Disney Princess kit was of course her favorite anything with Disney and princesses! This kit includes soft beeswax, a silicon mold, and six lip balm pods. The pods reflect the bright colors of iconic Disney princesses like Snow White and Cinderella. 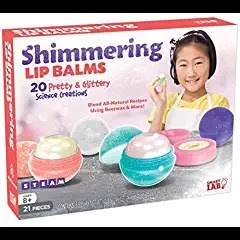 The SmartLab Toys Shimmering Lip Balms steam kit investigates chemistry and art. It includes 5 glittery lip balm pods and 20 different recipes for you to try! The SmartLab Toys All Natural Lip Balm Boutique beauty-based chemistry kit includes six lip balm containers one lip balm mold one lotion bar mold with four shapes one gift bag sticker sheet six lotion bar gift bags 42.2 grams beeswax pastilles and instruction pamphlet. The Handcrafted Lip Balm kit was more for an adult to make with children. It includes the pods, beeswax, and mold to make your own all-natural lip balms, with instructions to make 12 different types, each with its own flavor and benefits. From peppermint to hazelnut, you will have a perfect lip balm for every occasion. 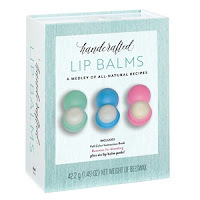 Handcrafted Lip Balms includes five round, colorful, and stylish lip balm pods, along with beeswax and an easy-release silicone mold. The pack-in guide book provides you with step-by-step instructions for safely melting and molding your lip balm, and how to enhance it with aromatherapy oils, nourishing cocoa butter, and soothing honey. These luxurious balms are perfect for gift-giving, or for treating yourself. Best of all, this elegant kit makes natural beauty at home not only fun, but simple enough to share with children. Enter below to win four Quarto Knows activity kits either the same or similar to the kits I reviewed. No SmartLab kits are included in this giveaway Quarto Knows kits only. Crazy Drinks Science Lab looks fun. SmartLab Toys Shimmering Lip Balms. My daughter would love to make her own Spa Soaps! I like the lip balm kit. 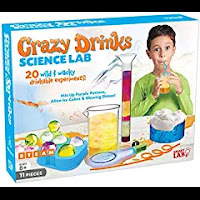 I think the SmartLab Toys Crazy Drinks Science Lab would be a lot of fun! I know my kids would love it. I would like any of the lip balm kits. My granddaughters always take mine whenever they come over.